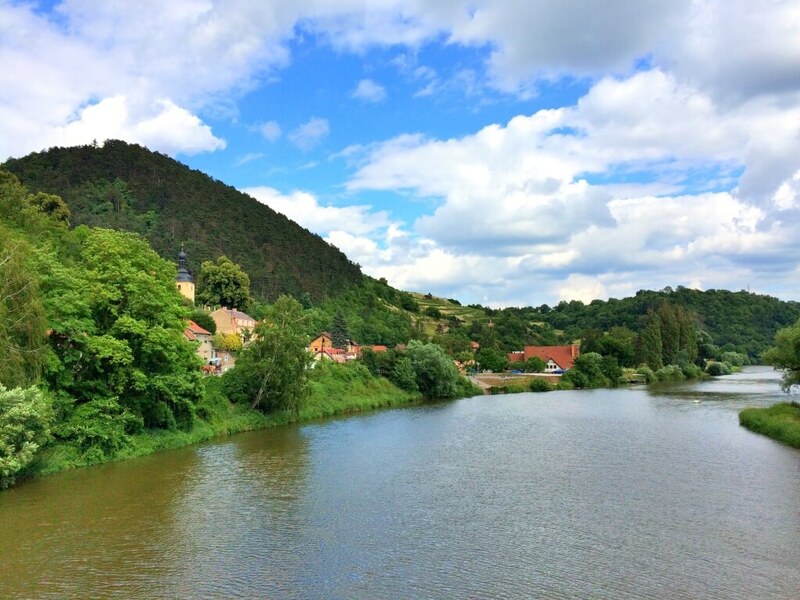 Pear and I visited Prague in Czech Republic and Dresden in Germany for 8 days in last week of June. We had a good time meeting new people, trying new flavors, experience different weather and seeing many interesting things. I have observed some cultural differences, and unalike etiquette of life and would like to share my observations with you. Architecture is an obvious difference to begin with. Thailand as a Buddhist country has numerous amazing temples or wats. Thai temples are usually beautifully decorated from outside and inside is not as delicate and neat as the outside. While in Prague, we visited few churches and we were amazed by the stunning and extravagant interior of each place, and very high-ceiling halls. I live in the city center of Bangkok so I am familiar with seeing a lot of new modern buildings, hotels, houses and condominiums coming up all the time, which is also the same as other developing parts of Thailand. I was impressed to see that in the residential area of Prague city center there are still many beautiful old buildings in different colors and people still live there. It was charming. I have visited a couple of big European cities before i.e. London and Paris. Both Pear and I have been to the US, but we both agreed we didn’t witness this much PDA! In Thailand it is not appropriate to show your affection toward your loved one in public, it could even be offensive for someone – especially for the older generation. Holding hands and wrapping your arm around your loved one are acceptable but not kissing or sucking one’s head off. We were not familiar with this concept of openness so every time we saw an action happening we just couldn’t help looking eyes wide open. 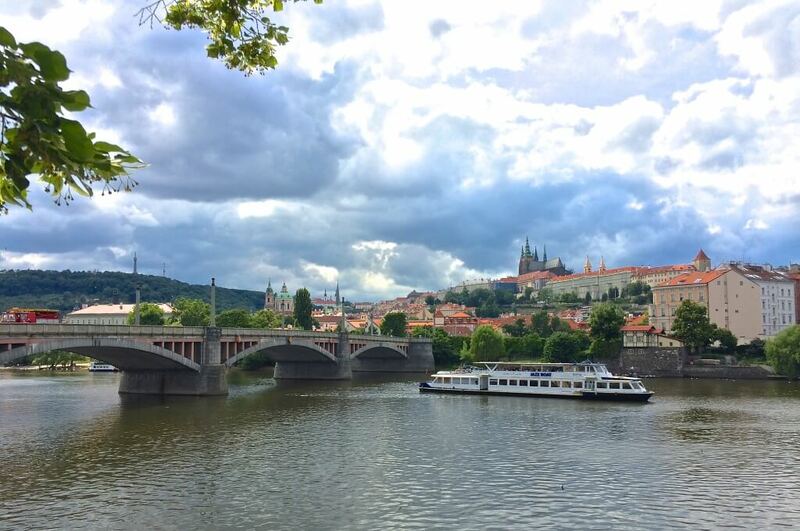 I have heard that Prague was one of the most romantic cities in the world. After visiting I thought one of the reasons could be how much affection people express to each other publicly. Although Thailand is not open for Public Display of Affection but ladyboys or ‘Katoeys’ are very well integrated into Thai life. They don’t need to hide. When I was in university , they are also allowed to wear female uniform to class. I have spoken to a few European students and I was told that it was not very good in Europe if you show that you were born differently. Thai people are generally very courteous and friendly, hence the moniker Land of Smiles. If you ask a question from a Thai and they don’t know, they might go out of their way trying to help you get the answer or politely say that they don’t know. We experienced a totally opposite thing from our trip. Many times we asked directions from a stranger whom we presume they were local, they would just shake their heads and walked away. We understood that they might not be able to speak English well enough, but the no response was pretty blunt. If you have visited a friend’s house or a temple in Thailand, you would be familiar with the custom of taking off your shoes before entering the front door. It is actually a must do in Thailand. If you do not comply it is extremely disrespectful. We visited at a friend’s house in Prague and I was going to take my shoes off before going in and I was told I didn’t need to. I felt a little bit strange to walk with shoes on inside and even going into the bathroom in the house just because I am so used to be shoeless in Thailand. 6. A big numbers of arts available. I think this is one of the major differences I have noticed. There are some form of arts to be seen everywhere. 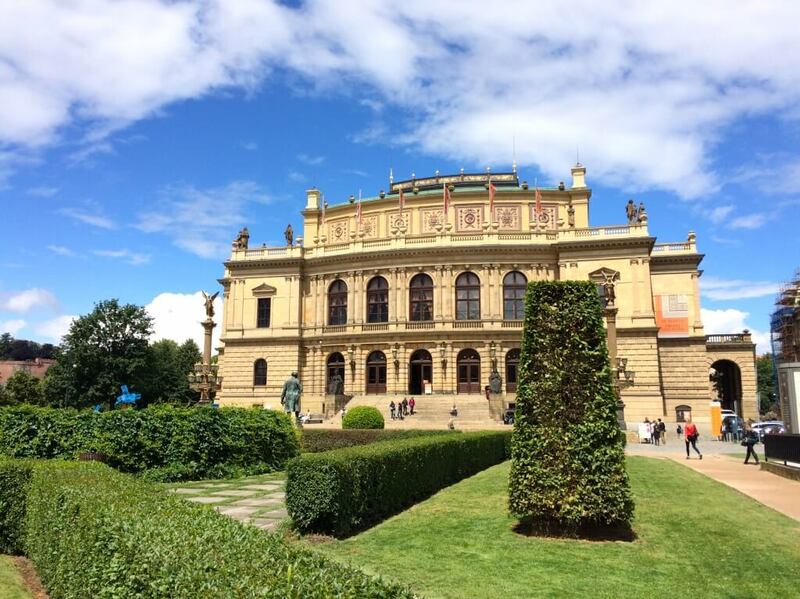 A lot of theaters, concert halls, art galleries, exhibitions or street shows in Prague. Art is genuinely a part of life in this city. Arts in Thailand are mostly shown in temples. We have just a few art galleries and museums and street performances are quite rare in Thailand. When you visit tourist attractions in Thailand i.e. museums, important temples, historical parks, you will see Thai numerals used to show the entrance fee. Sadly but true, the practice of dual pricing by using Thai letters and numbers, is widespread in Thailand as well as many other Asian countries. I understand that some foreign tourists could feel discriminated against when they are charged 4 to 5 times more than a Thai person for entry. We were happy that every tourist were charged a modest entrance fee same as with any local people. 8.There are no street dogs. If you have never been to Thailand you might be surprised to see a number of stay dogs and cats everywhere, in the city, on the beach, in the island etc. Thai people are kind in general and they want to do good deeds. If they see homeless dogs they will try to feed them. Different from many western countries, as far as I know, the government will take down those free-roaming cats and dogs. Many people in Prague are seen to be walking with their dogs everywhere. It gave a warm feeling in a way for me. Pear said she saw more different dog breeds in Prague than in Thailand. It is rare to see empty streets in Thailand with no cars or people. It is not surprise when you know that the population of Thailand as of 2015 is over 67 million people. The population density in Thailand is 131 people per square kilometer. 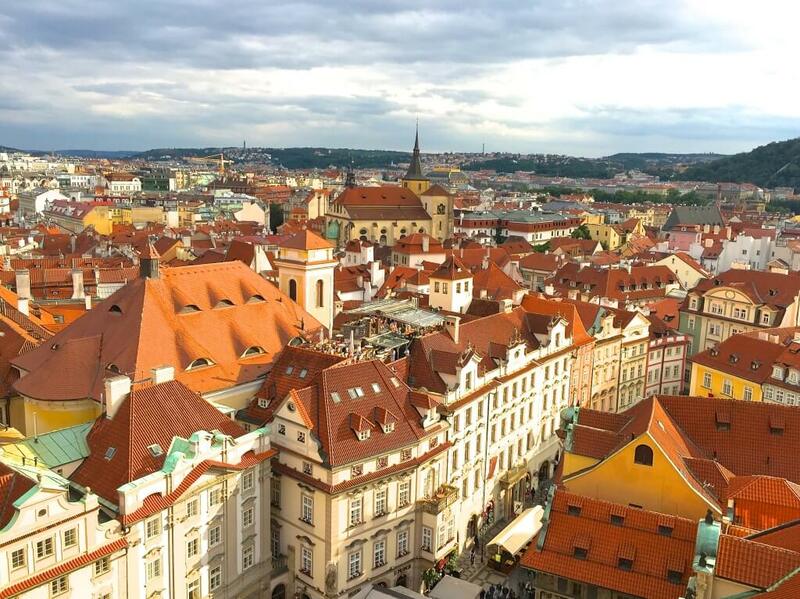 We stayed in a residential area just two train stops away from the area of Prague’s Old Town Square. Sometimes we didn’t see a single person on the street, with no cars going pass. It was really quiet. I don’t think I can find any place in Bangkok that has the same level of quietness. 10. Tap water can be drunk. As in most developed cities, tap water is clean and drinkable. It is not the same in Thailand, we have to buy bottled water or use water filter at home. Another difference is sparkling water is not common in Thailand. You will find only still water in convenient stores. Sparkling water in Thailand is available at fancy international restaurants or luxurious supermarkets. 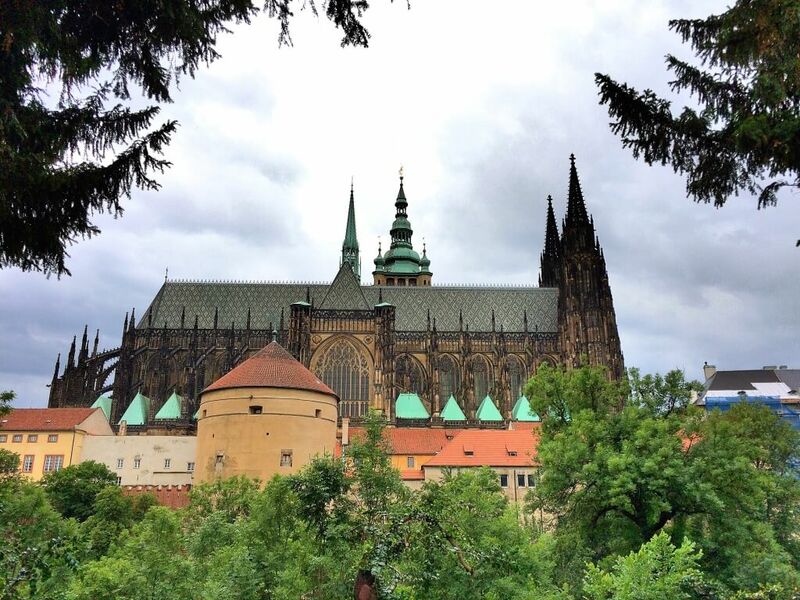 We had a shocking experience about water when we went to Prague castle. Without knowing, we bought a small bottle of still water each and it was 100 Czech crown (140 Baht) per bottle. And the second time in a bar in a hotel where a bottle of still water was more expensive than a cocktail. 11. Beer is cheaper than water! Czech Republic is famous for being the birthplace of pilsner; the country consumes more beer per capita than anywhere else in the world. And in Prague, beer is cheaper than bottled water. Beer prices get as low as 14 koruna a pint (that’s $0.80 or 0.54 euros), whereas water costs about 35 koruna for a .33 litre bottle. There is no place in Thailand where you can find normal drinking water more expensive than beer. 12. Plastic bags are not free. Coming from Thailand where you have to tell the bagger at the supermarket not to put things into too many separate bags and never pay for them. It was a surprise for me on my first shopping trip in a supermarket and after paying the bill, I was waiting for someone to put my things in the bag like I was used to in Thailand but nobody was doing anything. So later I learned if I wanted a bag I just had to tell the staff and pay for it. I think this is actually a good policy that Thailand should learn from. We are wasting too much natural resource. 13. Toilets are not free. I think this is my very first time outside Thailand that I had to pay for using the toilet. Most public toilets in Thailand are free of charge, even sometimes you have to pay the amount is next to nothing about 3-5 Baht. It was interesting too see a door that are allowed to open only when you put coins in, so we always needed to spare some coins in our wallet in case of an emergency. Unfortunately, Thailand is becoming more and more used to tipping with many restaurants, hotels by adding a 10% service charge to the bill. I personally don’t like that idea because I am almost certain that the actual staff sees non of this 10% auto-charge I am being charged, and I sympathize with them. We didn’t experience the same etiquette in Prague and Dresden. We gave tip when we were happy with the service. You must come to Poland, this is an interesting country, with good beer, snacks and the rest. : D I prefer the city of Poznań, more than Warsaw, because Warsaw is like all big cities on this planet, 😉 Poznań is a more charming city, also you can come to Wroclaw to. 🙂 Greetings from Poland! I really enjoyed reading your articles. Amazing facts!!! Since you have been to Paris. Could you plz share your views on differences/similarities between French festivals and Thai festivals. I just found your website as I was researching a little bit about Thailand. I watched a few clips on youtube and it seems that it’s a bit hard to learn Thai, at least this is what I feel for the first time when I hear Thai :). I’m sure that with time I will learn some as I’m thinking to move to Thailand for a while. Good luck with your project Mod. Your English is anytime more powerful than me although i live in Singapore. I pick up here and there to speak Thai. Although I can read thai consonants and vowels and figure out how a Thai word is being pronounce . Frankly speaking Thai is not easy to pick up. Now I start to follow BR3SOFT, one of the online Thai lessons, about 2 elephants, Paipu and Paipua, very interesting. Again I try to sing Thai elehpant song , a national Thai children rhythm. I like Thai songs, singer like Tai Orathai, her songs are so sweet.. Almost every year we were in BKK, just eat and shop. Hope to re-visit BKK soon. Wishing You All A Coming Happy New Year. Thank you for your comment. We are happy to hear that you enjoy our videos. It sound like you are very enthusiastic about learning Thai – that is nice! Keep practicing. Mountjoy writes for the website packed with security alarm articles and wireless security camera information. Home security using arduino Here a few things to take a look out when going to get a surveillance camera. The other option is always to hire the best service of security Orange Park for installing the identical. loved ones from harm inside the case of a house invasion. Yes in Thailand people will try to help you when you ask a question. Also if they don’t know the correct answer some people will give you any answer even if they know it’s not correct, because they don’t want to loose face. This is common when asking directions. com is known in China and it can demonstrate the logo has been verified by CCTV. linked by a single network which allows any business to continuously monitor every part of these premises. to suit your entire business needs. and zoom, the limits on their own flexibility become obvious when in comparison to IPTV. through the video cameras for the monitor(s) or recording device. Thank you for sharing your trip. Great photos and observations. I like number 3 and 4 the best! We need more smiles and lovingkindness in the west and more openness for cultural diversity! as a czech national living in Bangkok for over a year this has been a really fun article to read. It gives you the perspective how we people view world vastly differently from each other depending on how we are raised when we are kids. I felt the same way when i came in Thailand for the first time, just the exact opposite ! I would be like “what the …. are all those street dogs running around doing here ?” “Dual pricing ? What is going on ?” “Oh the booze is so expensive here” “I love the people here, everyone is so nice to you on any occasion and smiles constantly !” That last point is truly something i would like to see in my country as well … for me it´s one of the most beautiful parts of Thailand. 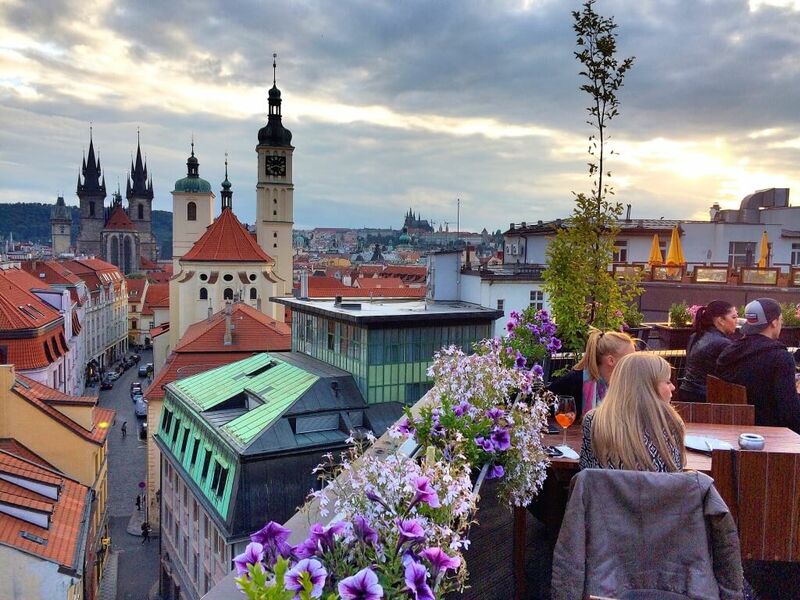 The real question is tho … How did you like Czech beer ? Thank you for reading my article. I am happy to hear that you found it interesting. I really loved your article and pictures. I have visited Bangkok 6 times and Prague 4 times, so I was really entertained by your comparisons! My 2 favorite cities! I was really shocked at how beer cost throughout Central and Eastern Europe also (very different than the U.S.). Keep up the great work, I truly love your articles. I finally started taking Thai language lessons at a nearby Temple in New York and having followed your blog has really helped! Hope you enjoy your Thai lessons! You mentioned the charges for entry to places of interest in Thailand. Just to point out, with a work permit, I can get the same entry fee as Thai people. I really enjoy your videos by the way. Still I really miss arts in Thailand, although the festivals are nice to visit, too. I mean street parades or temple festivals. Sometimes there are special markets or fairs. But not as often as the cities in germany are organizing them. Aside from that I really like the friendly and helpful Thai Attitude as well as the cheap food and water. I even prefer still water over soda. Still I miss the drinkable tap water (in my area in North Hessen Province it is even better than the bottled water, because the spring is right in our mountains). Thanks for your good work! I continue to lean Thai and find your stuff very helpful with that, among other sources. Eating lots of cherries everyday during my trip was on the top of my must-do list. Cherries in Thailand is about 800-1,000 Baht per kilogram! A few of my European friends living in Bangkok also said the same thing about missing arts and visiting museums in their home countries. Every place has its ups and downs, and it is always interesting to see the differences. Hi Mod and Pear, as always I enjoy reading your article, I hope you don’t adopt to many Western ways I would prefer we adopt Thai ways!! 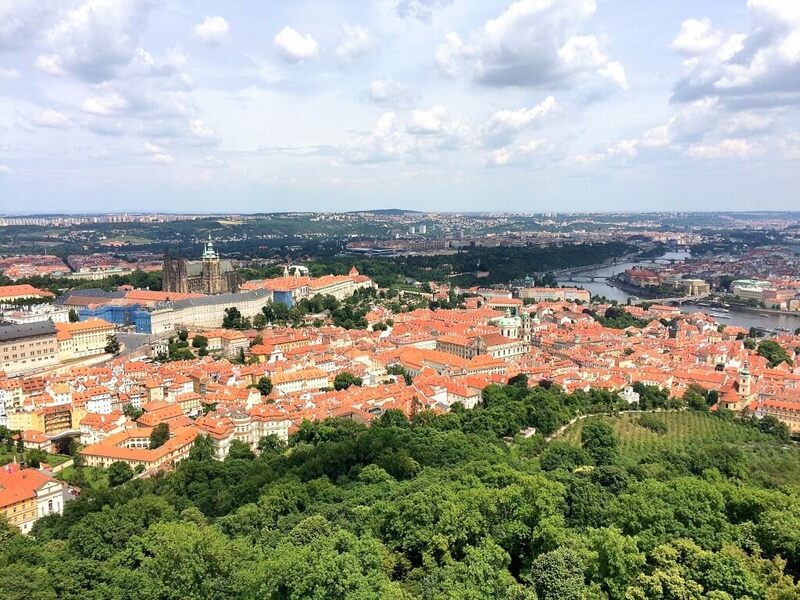 Interesting article with nice pictures that bring back memories from my own visits to Prague. In my former life I was a street dog myself so I really appreciate your empathy for this community. Enjoyed the comparison information and great photographs. It’s a very interesting insight into tourism through a Thai person’s eyes. Although I think ‘western’ countries vary greatly in their attitudes. 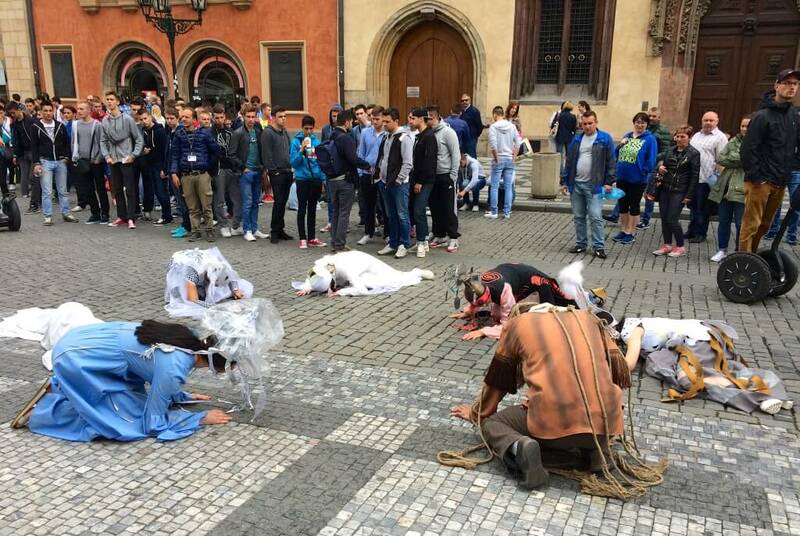 What might happen in Prague will certainly be incredibly different from towns in other European countries even though they are all ‘western’ I suppose. Beer certainly isn’t cheaper than water where I’m from in the UK, which is a shame! If I saw you you’d definitely get a smile and I’d say ผมสามารถช่วยคุณได้ ! You and Pear look like you’re having fun! I’m very glad to see you both enjoyed your trip in Europe. Thanks alot for your writing and lessons. I learn so much with you… I live in France. I’m not fluent in English but I’m your student. I began learning Thai 6 months ago. I will go to Bangkok next month (August 2015). I hope the weather will not too hot for me over there. Waiting for your next lesson. Thank you for checking out our article and following our lessons. Nice pictures and hope you had a nice time there. Here in Sweden we take off our shoes inside and walk in our socks. And the plastic bags you take yourself how many you think you need before you pay or tell the cashier that you need plasticbag and it cost you around 10-15 bath each and paperbags a little more expencier. Katoeys you not find here, but if you see any, you can only meet them in thai restaurants in the evening. Thanks for sharing information about your country too. Great photos. Hope you enjoyed trip. Good insight into cultural diffs. Nice images. Much of Europe is photogenic. 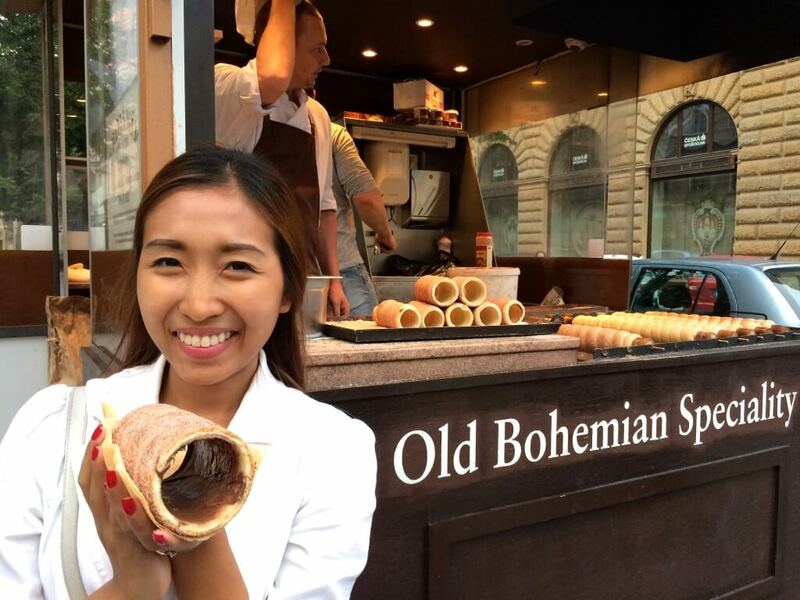 What are the cylindrical baked goods on the cart (Old Bohemian Specialty)? The pastry is called Trdelník. It is made from rolled dough that is wrapped around a stick, then grilled and topped with sugar and walnut mix. 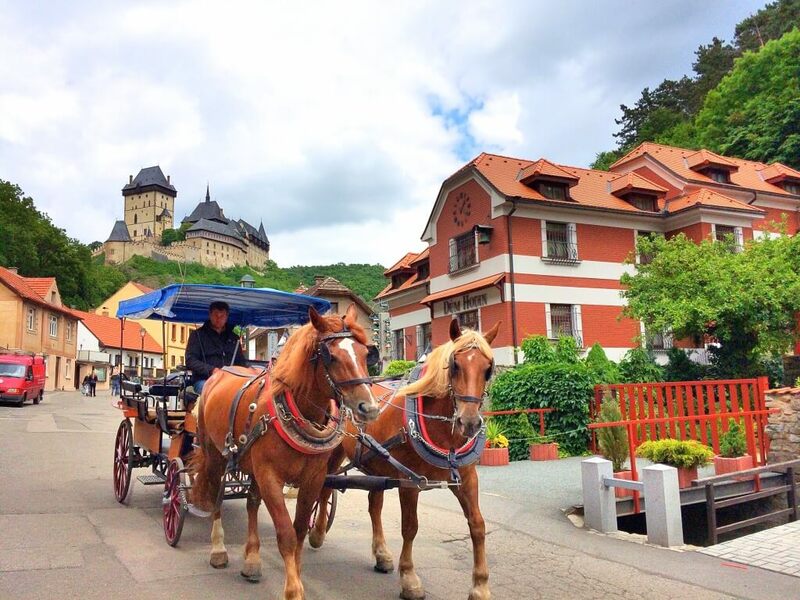 It is very popular among tourists in Czech Republic. Love the pictures! Very informative article. Looks like you girls had a great time. Please come to my city, Melbourne and I can show you some sights. I have a close Thai friend living in Melbourne, would like to visit there one day. What did you think of the food there ? I don’t drink beer so I had only a few sips during the whole trip. The food was nice , there are varieties of restaurants in Prague, we had local food and other cuisines. I worked in Prague for a few weeks back in 2001 and loved my time there. I still think I prefer living in Bangkok though. 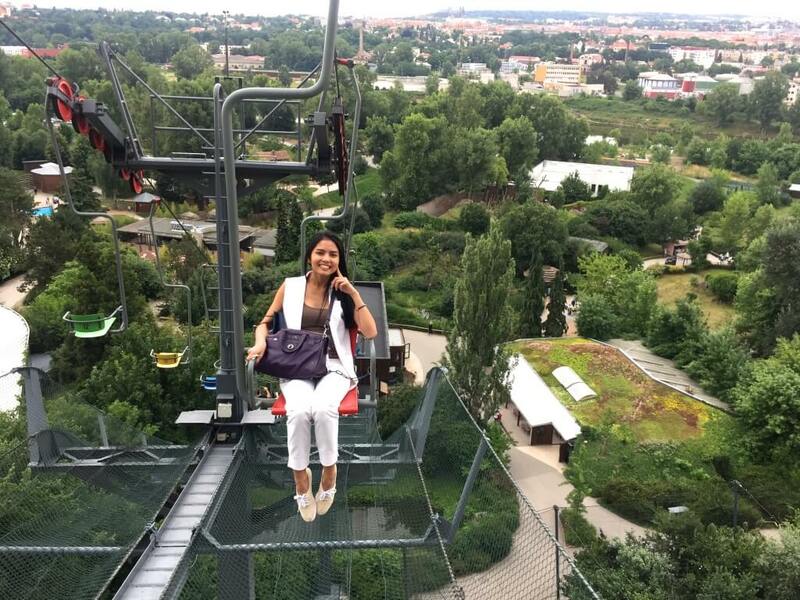 Hoped you had a great time in Prague. Nice to have read your comments of differences. The double price for tourists in thailand is a money greed attitude. I have been more than 40 times in Thailand and the double prices is upsetting me. I understand your frustration about double pricing in Thailand. 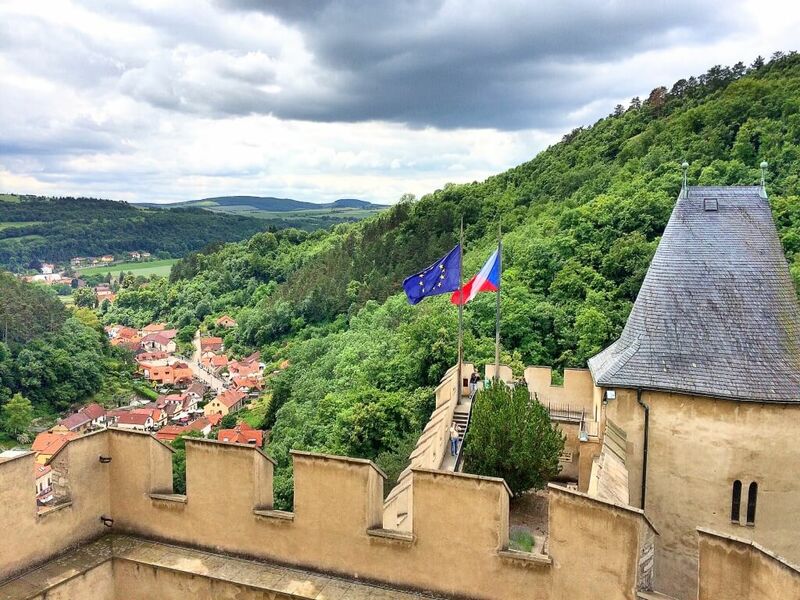 I have also visited Czech Republic and I enjoyed it very much. Thanks for sharing your thoughts with us. Just a quick note, the word you used here, “..some cultural differences, and UNALIKE etiquette of life…” does not exist. At least in the several dictionaries i checked. A good substitute would be “unique”, or maybe simply “different”. I don’t mean to pick, it just stuck in my head. Really enjoyed your Thai perspective on this trip. It helped me understand some of the cultural differences between Asia & other western countries. With my upcoming trip to Thailand for 2 months in Bangkok, your observations will help me enjoy my trip more. If you ever decide to come to Hawaii. Let me know, I would be happy to be your Host for a day. 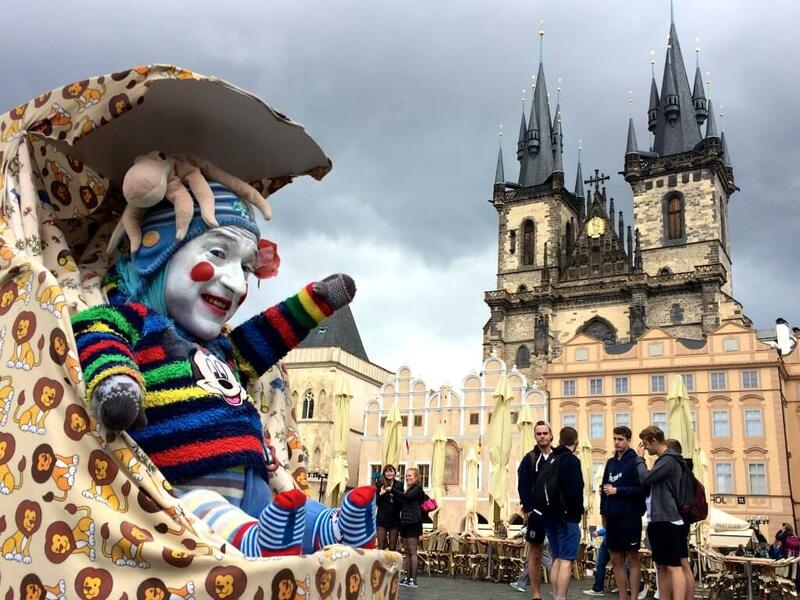 I will be in August in Prag. Sorry that we do not see us and make saook. In September we will be in pattaya. when can you teach us thai? We are back in Thailand. Pear is in Hua Hin a beach town 3 hours away from Bangkok, and I am in Bangkok. If this is convenient for you , please write us at adjima_t@hotmail.com to discuss further details. you have written a good article about your trip.